These three strategies will help you get more out of your strength training without adding weight to the bar. It's not about the weight; it's about the work. That is the most beneficial piece of advice anyone has ever given me about strength training. It's so simple--almost too simple--but extremely operative when you're trying to make exercises harder or more effective. And I've used it as the backbone of my training philosophy. Sure, I love to push heavy weight around and have my clients do the same, but never at the expense of exercise efficiency, proper technique and safety. There is definitely a time and place to keep loading on plates, but for enhanced results, you may want to master the move in other ways. Here are 3 ways to make any exercise harder without adding weight. This sounds like a no-brainer, but partial reps, whether they're intentional or not, are way more common than they should be. Half and quarter reps have their place, but nothing will ever trump full range of motion when it comes to increasing size, strength and power. A 2012 study in the Journal of Strength and Conditioning Research found that training with full ROM improved muscle strength and thickness more effectively than training with partial reps. A 2014 study concluded that ROM should never be compromised for greater external loading. Wherever you think your full ROM is right now, there's a good chance you can improve it to reap additional benefits. Let's take the Barbell Back Squat, for example. This is an exercise that often gets botched. People sacrifice technique for big numbers. You need to evaluate the connection between your full ROM and your 1-rep max (or whatever you test for). 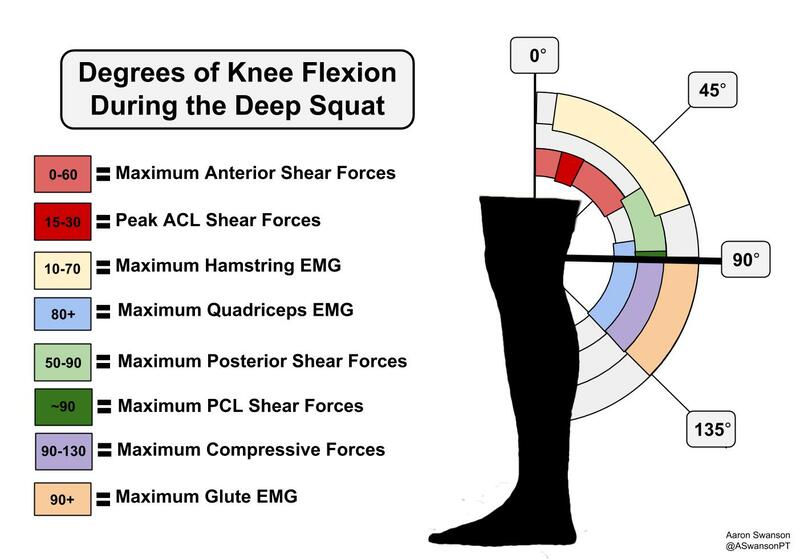 If you have a 1RM Squat of 500 pounds, but only 60 degrees of knee flexion at the deepest point, two things are definitely happening: 1/ you are missing out on loads of glute activation, which occurs when you achieve 90-plus degrees of knee flexion; and 2/ you are squatting in the depth zone at which shear forces on your anterior and posterior anatomy are at their peak. Five hundred pounds on your spine at the peak of shear forces doesn't sound smart, safe or fun to me. Even 90-degree squatters can improve their ROM, though. According to Dr. Aaron Swanson, the 90-degree point of a Squat is where max shear forces occur on the PCL, on the body and on the posterior chain. In this case, you may want to go past parallel, to 100-135 degrees of knee flexion, to have the safest and most effective movement possible. Imagine how much more impressive your 500-pound Squat will be with 110 degrees of knee flexion, decreased risk of injury and zero pain. Sounds like something I want to be a part of. Trust me, I'm not the guy who says your Squat doesn't count if you don't go below parallel. Who am I to tell another person that his efforts aren't good enough? My goal is to tell you how you can continue to improve your performance, and one major way is to increase range of motion during exercise. Of course, range of motion goes way beyond the Squat. You can increase your ROM in just about any movement. Below are a few of my favorites. Altering your training tempo is by far my favorite way to make an exercise harder. Controlling the tempo makes for a more effective movement, and you master the technique with increased time under tension. If you're not familiar with the formatting of exercise tempo, it's actually quite simple. You'll see a number like 2-0-2-0 on your program. The first number (2) indicates the number of seconds for the eccentric (lowering) portion of the lift. The second number (0) indicates any pause at the midpoint of the lift. The third number (2) indicates the number of seconds for concentric (lifting) portion of the movement. And the fourth and final number (0) indicates any pause at the top of the lift between reps.
One surefire way to build new muscle and strength is to take advantage of tempo control. There are two common ways to do this, and I'm a fan of both. Eccentric Overloading. We are stronger on the eccentric portion of a lift than the concentric. We can handle almost twice the weight in the lowering phase than war can during the lifting phase. You can take advantage of this by loading up for heavy negatives (with spotters). Heavy weight at a controlled, steady eccentric movement will help you burst through a plateau fast. Time Under Tension. I love programming 5-1-5-1 tempo exercises because the time under tension is absolutely insane, in a good way. With each rep taking 12 seconds, when performed properly, a set of 6 should take 72 seconds. That is 24 seconds more muscular involvement than a set of 12 at a standard 2-0-2-0 tempo. And you can use the same weight for both. Without sacrificing external loading, you've given yourself an extra 24 seconds of muscular activity, which can make all the difference when it comes to driving your gains. Changing the tempo goes beyond actual movement speed. You can also change the tempo of the entire workout. For example, in Pat Davidson's legendary MASS program, he made great use of 30/30 and 20/40 work-to-rest ratios. With preset work and rest periods, plus suggested loading, you can really achieve a huge volume in a short time. Volume is a grossly underappreciated aspect of strength training. The benefits speak for themselves. Beyond that, there are many other ways to alter the tempo and make an exercise harder. Rep schemes like AMRAP and EMOM, which are featured in my Barbell Barbarian program, are also great ways to increase volume at a faster tempo. Band-Resisted Kettlebell Swing, 12 reps EMOM, 5 minutes. Controlling the tempo in two different ways: Speeding up the eccentric swinging with a band and every minute on the minute set/rep set-up for conditioning. Targeting the tension is a super impactful way to make any exercise harder without adding more weight to the bar. The best part is that there is really no wrong way to do it. Simply choose a point of emphasis you want to target and use mind-muscle control during the entire movement to force energy into that area. For those who still aren't with me, let's look at the RKC Plank. Instead of just holding a standard Plank, watching the seconds tick by, you want to force targeted tension into your core. To achieve this, you clench both fists, viciously squeeze your glutes, press your elbows so hard down into the floor that you're trying to break the ground, and then imagine trying to bring your toes and elbows together in the middle of your body (without actually moving them). Can you see how much more tension is being applied during this movement? That is how you target the tension. During the entire movement, grip the bar with every ounce of force you have. During the concentric motion, imagine trying to move your hands to the middle of the bar (similar to your feet/hands in the RKC Plank). This technique will smoke your chest, core, forearms and triceps. Funny, those are some of the agonists and synergists of the perfect Bench Press. Place a medicine ball on the ground between your feet (hip-width). The ball will not only be used as a depth marker, but also as an implement to target tension. During the eccentric phase of the Squat, actively squeeze your ankles into the ball, while forcing your knees outward. Every muscle from the waist down will be activated. Lower yourself until you tap the ball, pause for a split-second and begin the concentric portion of your squat. You can alter both of the exercises above to include all three strategies. I've mentioned range of motion, tempo and tension. I also love the RKC Plank and anything using Mark Bell's Slingshot Hip Circles for targeting glute activation. Hopefully you can apply some of these tactics to your training and reap the benefits of variety. Remember, it's not about the weight, it's about the work! Pinto RS, Gomes N, Radaelli R, Botton CE, Brown LE, Bottaro M. "Effect of range of motion on muscle strength and thickness," Journal of Strength & Cond Res. 2012 Aug;26(8):2140-5. McMahon GE, Morse CI, Burden A, Winwood K, Onambélé GL. "Impact of range of motion during ecologically valid resistance training protocols on muscle size, subcutaneous fat, and strength," Journal of Strength & Cond Res. 2014 Jan;28(1):245-55. Are Bodybuilding Workouts Appropriate for Athletes?